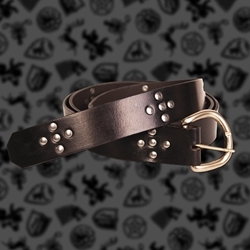 This Game of Thrones Cross Long Belt is a belt that is made entirely from top quality leather and features a dark black coloration. Nickel-colored metal fittings adorn the belt in the form of crosses along its length. The belt is buckled and offered in one long size, having a total length of 66.5 inches. This allows the Game of Thrones Cross Belt to be easily buckled and then tied in the traditional fashion of a medieval ring belt. One size fits most.